When it comes to having breakfast at Epcot, choices are few. While there are two table service restaurants that serve breakfast, when it comes to quick service there is really only one choice. Lucky for Epcot guests, it is really good. The Land Pavilion in Future World has what we believe to be the best place to grab breakfast at Epcot. 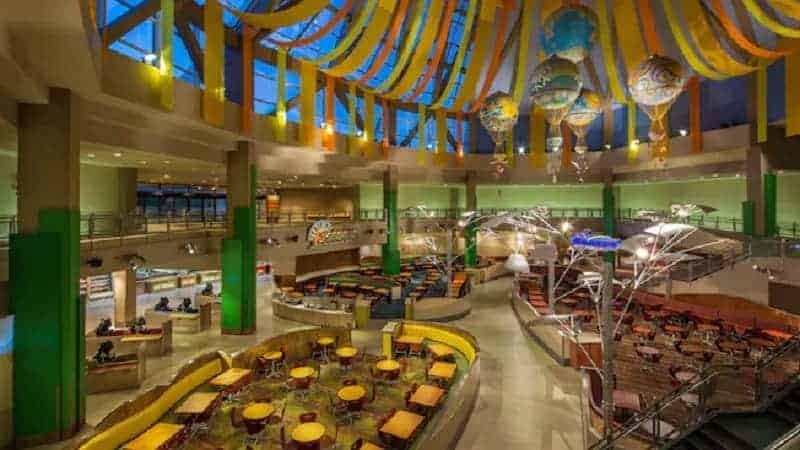 Located on the ground floor, adjacent to Living off the Land, Sunshine Seasons is a quick service restaurant that features a large range of breakfast favorites. You will find large breakfast platters featuring Scrambled Eggs, Bacon, Sausage, Breakfast Potatoes and Cinnamon French Toast Bread Pudding at Sunshine Seasons. These are huge and could easily be split between two people. There are also Breakfast Croissant Sandwiches, Breakfast wraps and even a Breakfast Soufflé. If you are looking for smaller options, you can choose items like cinnamon rolls, coffee cakes, danishes and yogurt. Seating is plentiful and you will appreciate being able to sit down for a good breakfast at Epcot when you will be spending your day walking through out the World Showcase. While the World Showcase doesn’t open until 11 am, those with breakfast reservations for Princess Storybook Dining breakfast can access the Norway pavilion as early as 8am. Those dining at Akershus will have their pictures taken with Belle before being seated for breakfast. Breakfast is traditional American served family style. You will find unlimited scrambled eggs, bacon, sausage, potato casserole, cinnamon rolls and fresh fruit brought to your table. The main draw to Akershus is the Disney Princesses. Besides seeing Belle, guests will also get to meet with Snow White, Cinderella, Sleeping Beauty, and Ariel. Another great perk of dining here early in the morning is that you can go ahead and line up for Frozen Ever After in the event you don’t get a Fastpass. This rotating restaurant in Future World is one of the few places where you can dine and meet Chip and Dale. Along with these famous chipmunks, you will also get to see Mickey Mouse (dressed as a farmer) and Pluto. Breakfast is a traditional American feast served family style. You’ll find scrambled eggs, breakfast meats, Mickey Waffles and Sticky buns. As you eat, the restaurant rotates to show guests different landscapes: thunderstorm, prairie, farmhouse, rain forest and sandstorm. 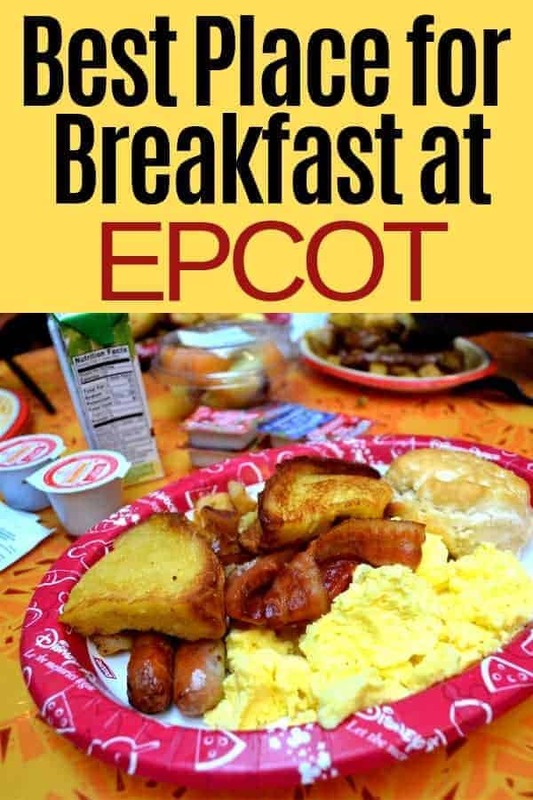 If none of these Epcot breakfast options excite you, consider taking the monorail to the Magic Kingdom Resorts. All of them have table service restaurants that you may need a reservation for & quick service restaurants with great breakfasts. We really like the breakfasts at both Gasparilla Island Grill & Grand Floridian Cafe at the Grand Floridian Resort. Where do you go for breakfast at Epcot?